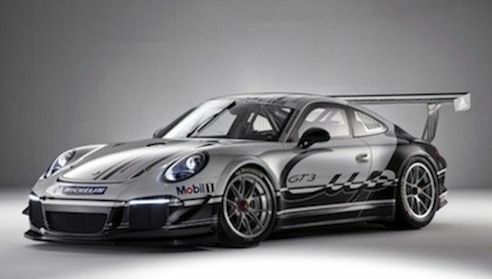 The new 2013 Porsche 911 GT3 Cup has been revealed and it’s motorsports version of the future Porsche 911 GT3 RS. Porsche has just revealed the 2013 911 GT3 Cup which is the most successful race car in the world. The new 2013 911 GT3 Cup is motorsports version of the future 911 GT3, and gives performance fans a preview of the high-performance Porsche 911 GT3 RS road production car. The newly revealed race car is based on the seventh generation of the sports car icon from Zuffenhausen. It’s been a popular car among sports enthusiasts and Porsche has produced 2,395 units of the near standard vehicle for customer sport since 1998. The new 2013 Porsche 911 GT3 Cup is powered by a 3.8-liter six-cylinder engine that produces 460 hp which is a 10 horsepower bump from the previous model. It’s mated to a six-speed “dog-type” gearbox developed by Porsche Motorsport which is operated via shift paddles. This is the first time Porsche has used the new transmission in their brand trophy race car. Another feature newly designed by Porsche Motorsport, are the single piece center mount race wheels. The high-performance race car uses Michelin race slicks that have been increased to 10.63 inches at the front and the rear now measure 12.20 inches. It will also receive an upgrade to the performance brakes. The 15-inch slotted and inner-vented steel brake rotors at the front axle are decelerated by six-piston aluminum fixed callipers. The rear axle features a four-piston version. Driver safety is paramount, and Porsche engineers developed a new safety cage to protect the driver in case of a roll or a collision. The racing seat has also been redesigned which is distinctively shaped around the head and shoulders and can be adjusted individually with the help of padding. It includes a rescue hatch in the roof which provides easy access for medical personnel and for quicker extrication of the driver. The new 911 GT3 Cup will be run exclusively in the Porsche Mobil 1 Supercup next year. It made its racing debut at the end of this season’s “Night of Champions” celebration at the R&D Centre in Weissach. The new Porsche 911 GT3 Cup will be produced in Stuttgart-Zuffenhausen on the same assembly line as the street-legal production versions. The sports car will be tested at the Motorsport Center in Weissach, where it receives a general set-up for the circuit and is tested by a professional race driver before being delivered to customers. The base price for the high-performance race car is 181,200 Euro ‘s ($234,219 U.S.) The new 2013 Porsche 911 GT3 Cup gives performance fans a good idea of what the future Porsche 911 GT3 RS will look like, and it’s an exciting future indeed. Watch the Porsche 911 GT3 Cup video below.